After drunkenly saving a dragon in the woods, the once normal life of a workaholic takes a wild turn as the aforementioned dragon, named Tohru, devotes her life to serving the woman. Once introverted and disinterested in much else outside of work, Miss Kobayashi is faced with introducing the rules of the human world to Tohru whilst adjusting to living with others and developing her own personal skills. Needless to say, there are some hilarious misunderstandings to be had. There is a sweet spot to be had in the “daily life” comedy sub genre- something that highlights the blissful highs, but doesn’t shy away from subtle melancholy notes. Good outweighs the momentary lapses in high notes, and the optimistic stories continue on with joyous comedy. No, this style isn’t for everyone since it typically shows worlds gently moving by, but it is undeniably more enjoyable that way. 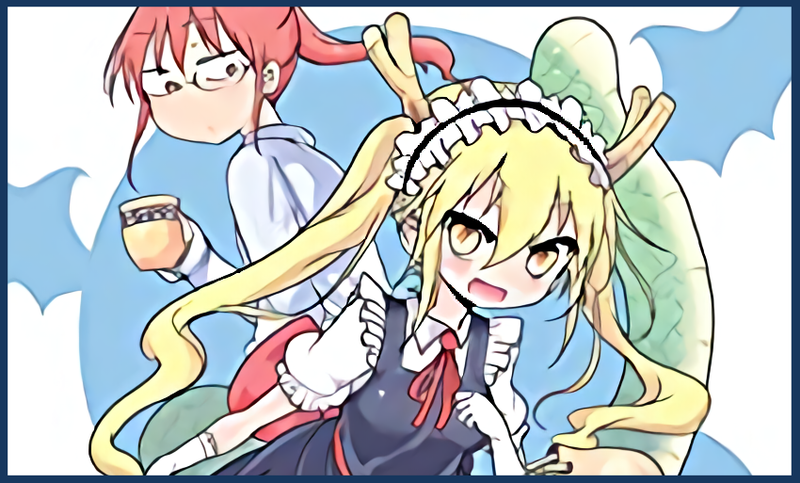 Dragon Maid is an embodiment of what works best in this variant of the genre- side splitting comedy, warm character development, and just enough conflict to help make the characters more cohesive. While the premise of otherworldly beings getting accustomed to the daily life of normal humans isn’t anything new, there are several angles in going about it that haven’t really been explored in manga. One of these in particular that Dragon Maid shines with is the own independent growth in the world of the guide character, Miss Kobayashi. Through explaining customs, courtesies, and basic habits to her new dragonkin roommate, the audience get to see someone slowly come out of their shell and partake in many of the same traditions she preaches. When the first chapter unfolds, it is incredibly unlikely to believe that someone so stoic and independent would want to be festive and caring by as soon as the conclusion of the first volume. Even as her home grows bigger, Kobayashi takes leaps to ensure the well being of strangers to a new world. This sort of thing adds a tremendous amount of depth and staying power behind the storytelling of the series. The meat and potatoes of the manga without a doubt can be found in the comedy, and thankfully it doesn’t disappoint in the slightest. Every once and a while a joke or gag might miss the plate, but for the most part everything feels warm and silly enough to keep the lungs working overtime with enjoyment from each chapter. The opportunity to tear apart things that people do on a daily basis is never wasted, and the jokes know exactly how long to stick around before moving on to the next bit. Even some of the more legendary comedies keep jokes going a little bit too long, however nothing in the first volume of Dragon Maid fits that description. It seems difficult to sustain long-term, but I am looking forward to the comedy staying heavy hitting for many releases to come. Somewhere I was not anticipating a lot of polish in that gave quite the show was the art style. While scarce and sudden, there are moments where things pick up a bit in the story and the illustrations take an appropriate leap in quality as well. 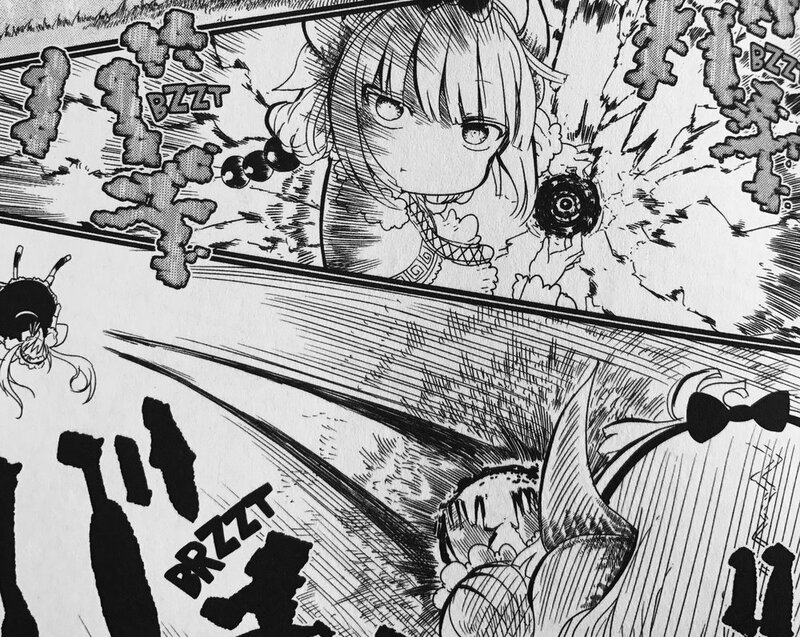 Two occasions in particular found Tohru in combat, with both showcasing sharp detail. Perhaps it is having soft and calm flows around the moments, but the art talent felt better than a lot of action manga I’ve read in recent memory. 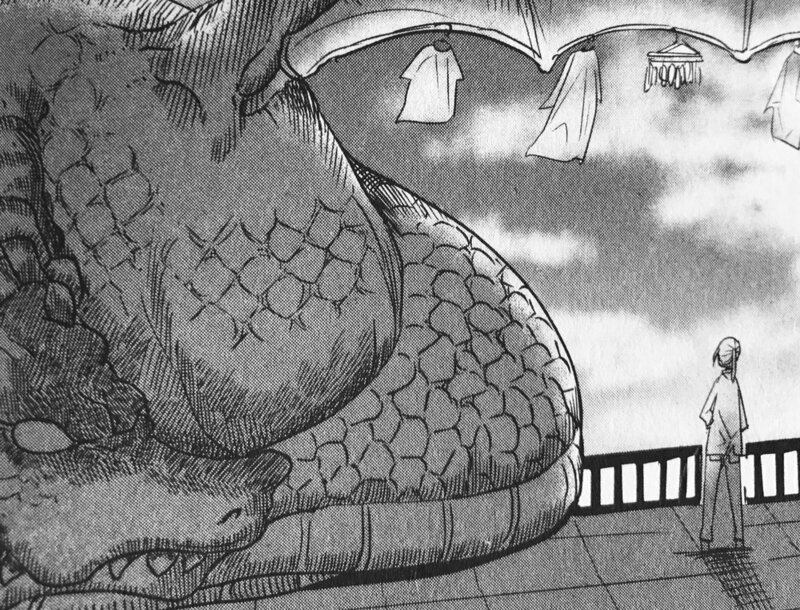 The hyper-realism that panels seem to take when Tohru dons her true form as a dragon or uses magic feels unbelievable given the context it can sometimes be in. However you look at, fluke or not, there is no denying the merit it deserves. Finally, I was amazed with how quickly the story managed to pull in the reader and cover a lot of events for the Kobayashi household in such a short amount of time. No corners felt cut as the chapters flew by and surprise came over me when the volume had already reached its conclusion. With a premise gushing with potential for stories to be had, it is a welcoming sight to see it knows how to manage its hand smoothly. It is no surprise this series adapted so well into an anime, because there is an abundance of good times to be had here. It is no surprise this series has become as popular as it has so quickly- there really isn’t a whole lot not to like here. It manages to deliver on a promise of comedy and even sprinkles of slice of life (inadvertently?) effectively. Dragon Maid blends great times with surprisingly profound character development for what is bound to be a really good time. 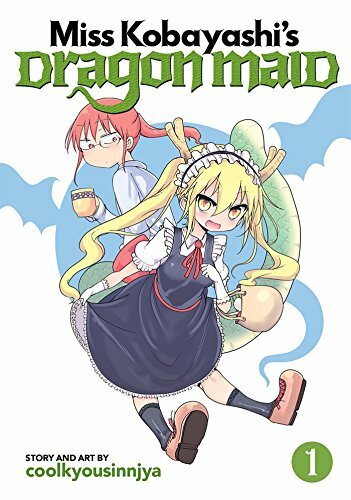 Miss Kobayashi's Dragon Maid is written by Coolkyousinnijya and began publication in May 2013 by Futabasha in their Monthly Action imprint. It received an anime adaptation in the Winter 2017 season by Kyoto Animation.